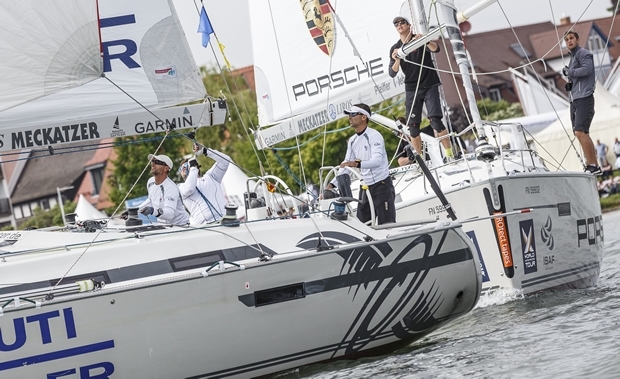 Switzerland’s Eric Monnin and Croatia’s Tomislav Basic dispatched their younger opponents Joachim Aschenbrenner and Matt Jerwood in todays Semi Finals at Match Race Germany. The 39 yearr old Swiss match racer will meet 40 year old Basic in tomorrow’s finals. In the second semi-finals, 22 year old Matt Jerwood from Australia, competing in his first World Match Racing Tour event, won his first two races against event favourite Basic. Jerwood needed just one more race to secure their place in the finals. But Basic was not going quietly levelling the score at 2-2, with a ‘winner take all’ race for the final.